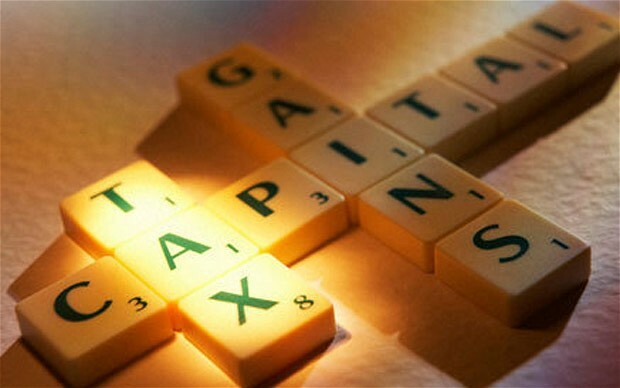 Under Section 121 of the IRS Code, and spelled out in IRS Publication 523 (2013), pop over to this site More about the author homeowners who sell their primary residence may be able to exclude from income any gain up to a limit of $500,000 if the homeowners are married and file a joint tax return. The limit is $250,000 for a single income tax filer or a married couple filing separately. There is a common misunderstanding that this money has to be rolled into the next house the seller may be purchasing as a down payment in order to avoid paying income tax on the gain and that is simply not true. The seller can do with that money whatever they wish. There is no requirement to reinvest any gains from the sale of a primary residence into another piece of real estate. Under current tax law, to exclude the gain from income a seller must have owned and lived in the property as their primary residence for at least 2 years during the last 5-year period ending on the date of the sale. It is important to note that the two years of occupancy does not have to be continuous or consecutive, as long as the total time is 2 years of the last 5 years. This deduction only applies to a primary residence and can be exercised every two years. There are several exceptions to the exclusion amount as well as the occupancy rule and a seller should consult a tax preparer regarding their specific circumstance. For a seller to figure the gain or loss on the sale of their primary residence the seller must know the selling price, any selling expenses, the amount realized, and the adjusted basis. 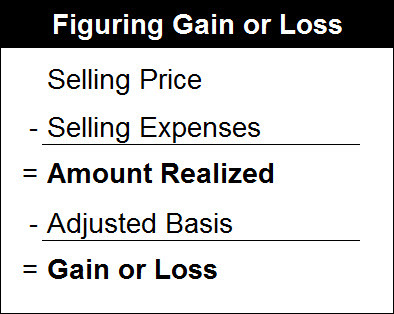 Subtract the adjusted basis from the amount realized to get the gain or loss. The selling price is the total amount a seller receives for their home, but doesn’t include amounts a seller may have received for personal property sold with the home, such as furniture, refrigerator, washer, dryer, spa, etc… The value of these items must be included in the seller’s income, but not as part of the sale of the home. The amount realized is the selling price minus selling expenses, which include commissions, advertising fees, legal fees, plus any points paid by the seller on the buyer’s behalf. If a seller bought or built the house the seller’s basis in the house is generally the cost of the house, including the cost of construction, plus any settlement fees or closing costs associated with buying the house, such as certain title fees, recording fees, transfer or stamp taxes, but not the fees and costs associated with obtaining a mortgage. For a complete list of acceptable and unacceptable fees refer to IRS Publication 523 (2013) or contact your tax preparer. If a seller inherited the house or traded or received the house as a gift, the seller’s basis is generally either its fair market value when they received the house or the adjusted basis of the previous owner. Homeowners often make improvements to their houses and those improvements may potentially increase (adjust) the seller’s basis. Following is a detailed list from the IRS showing the types of improvements that add value to a house, prolong its useful life, or adapt it to new uses. A seller can add the cost of these additions to the basis of their property. 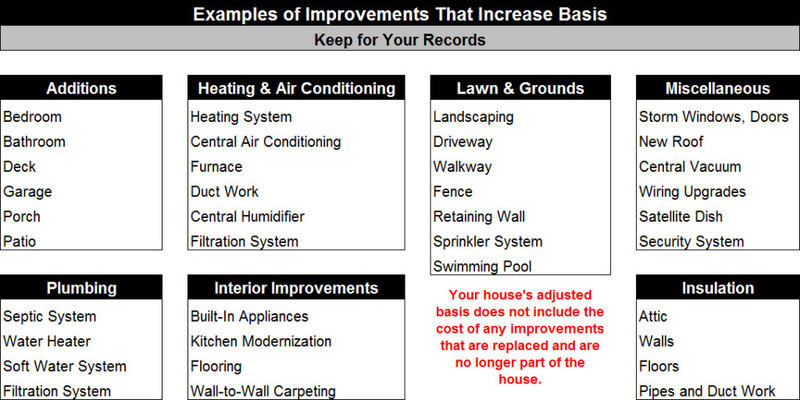 With that in mind, ALL homeowners should keep detailed records of their house’s purchase price and purchase expenses, as well as receipts and other records for all improvements, additions, and other items that affect a house’s adjusted basis. There are things that can reduce a seller’s basis as well. Let me illustrate with an example. Let’s say Bob & Amy sold their house to Joe & Mary, and Bob & Amy were generous enough to pay 1 loan discount point (e.g., $3,000) on Joe & Mary’s behalf to help them obtain a lower interest rate on their mortgage. Bob & Amy will be able to increase their basis by the value of the point paid on Joe & Mary’s behalf. When Joe & Amy decide to sell the house in question, they will have to reduce their basis by the value of the loan discount point that Bob & Amy paid on their behalf. Similar rules apply to the payment of property taxes on a buyer or seller’s behalf. Taking this example one step further, if a seller has refinanced their home at some point in time and has not deducted the full value of the points they paid to secure a mortgage on the house being sold, the seller may be able to deduct the remaining value of those points in the year of the sale. The key point we want to convey here is that owning a home (and carrying a mortgage) has a variety of tax benefits and many homeowners are unaware of those benefits and how they work to the homeowner’s advantage. Can you imagine how much your tax bill would be if you had to include any profit from the sale of your primary residence in your household taxable income?